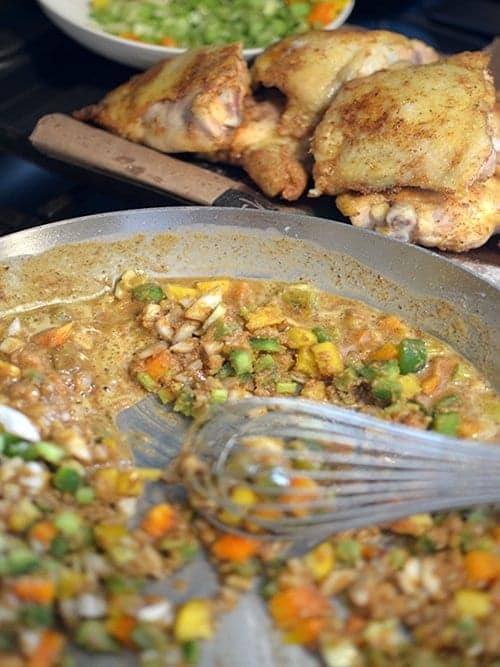 Sausage and Chicken Gumbo is a timeless recipe that features a rich Creole stew. 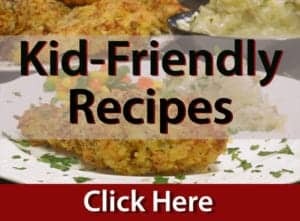 This a is a flavorful and satisfying meal that is easy to make, even if you don’t live in Cajun country! 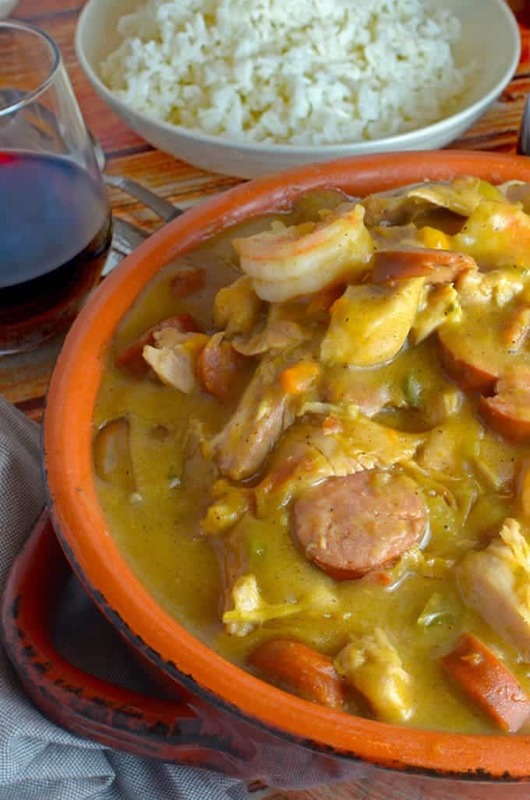 Sausage and Chicken Gumbo with some shrimp added into the mix makes for an unforgettable dish. The day we put t his together, my calendar told me that it was mid spring here in Wisconsin but morning’s snowflakes told me otherwise. Not one to let this weather get me down, I decided to make the most of it and my mind began to contemplate comfort foods. 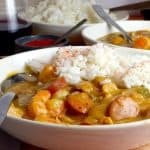 For some reason the idea of a warm and hearty gumbo came to mind and this sausage and chicken gumbo recipe turned out to be just the ticket. One of the things that I enjoy the most about this sausage and chicken gumbo is the fact that it involves real cooking. There is some dredging involved, there is a mirepoix of sorts, and there’s even a roux! Sure, it takes a little bit of effort to put this hearty stew together but the end product is worth every single second. 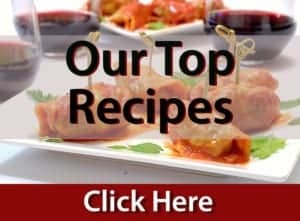 I had the luxury of having a good friend help out with much of the prep work which made this recipe even more fun. The best part though was when we all sat down together with a glass of wine and a big bowl of this tasty gumbo. File powder is optional, but it is integral to authentic gumbo. Filé js an herb that is extracted from dried, ground leaves of the sassafras tree. Many grocery stores carry filé and many don’t stock it. I picked some up at Penzeys Spices but you can also order some here. It’s not expensive. Once the seasoning mixture is put together, it’s time to spread some Cajun love onto the chicken. The chicken then gets a quick dredge in some flour that has some of the seasoning mixed in with it and then spends a couple of minutes getting seared in hot oil. Dredging seasoned chicien breasts in seasoned flower. 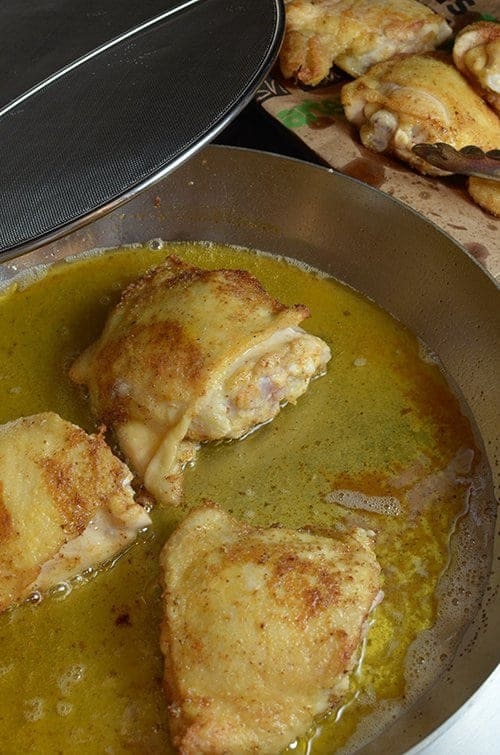 Searing seasoned chicken thighs in oil. 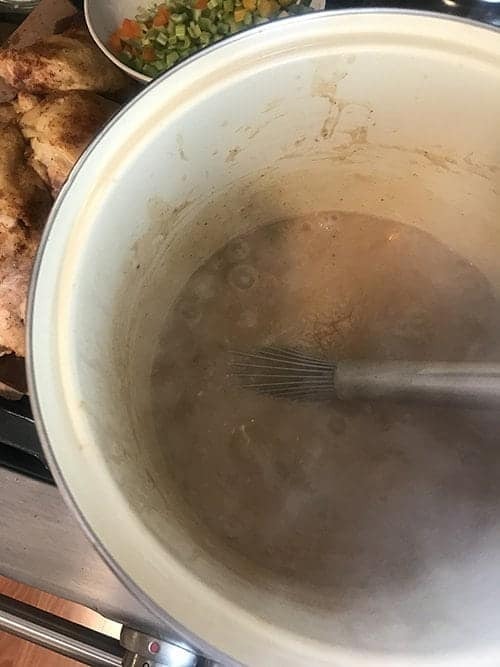 After searing, the chicken is briefly set aside and a roux is made using about a cup of reserved oil that was used to sear the chicken and the remaining seasoned flower leftover from dredging the chicken. The roux that is desired for making a gumbo is a dark one. Think: dark chocolate, in color. This takes a good 10 minutes or so to achieve. 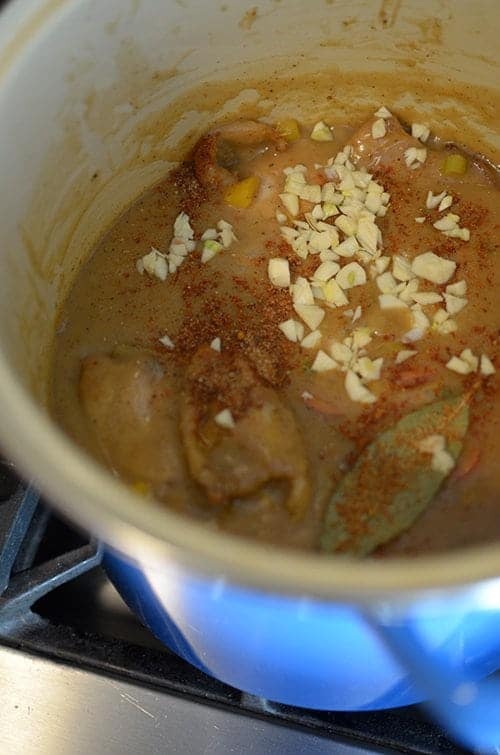 A darker roux lends a deeper and more structured finish to this sausage and chicken gumbo. We discuss what a roux is and how to make it, in much greater detail here. Adding seasoned flour for making a gumbo roux. The roux is stirred in a hot pan until it is dark and thick. While the roux is being made, you take a big kitchen pot and bring about 9 cups of chicken broth to a simmer, covered. For this sausage and chicken gumbo recipe, I use one of my new favorite kitchen pieces, this beautiful and versatile stock pot. I have the dark blue one and I make all sorts of things in it like goulash, soup, and so much more. A Cajun mirepoix is added to the roux. Slowly add the roux to the hot broth, while stirring constantly. Once the roux develops into a dark color and thick texture, it’s time to add the Cajun mirepoix. This version differs from a classic mirepoix in that carrots are substituted for green peppers. In Cajun country this combination is referred to as the holy trinity. We wanted to add a bit more color and sweetness and therefore we use a combination of yellow and orange bell peppers. As with a traditional mirepoix, we add approximately equal amounts of finely chopped onion and celery to the pepper. Next, we stir the roux into the broth until it is fully incorporated and then we add our slices of andouille sausage. We simmer this for about 15 minutes and stir frequently, allowing the gumbo’s flavor to develop a bit while it reduces and thickens slightly. Finally, the chicken is added to the pot, along with a bay leaf or two and then we cover the pot and allow the chicken to finish cooking. This takes about an hour or so. Finish cooking the chicken in a large covered pot with the rest of the gumbo. Once the chicken if cooked through, it is removed from the pot and allowed to cool for a few minutes. Next, we take the meat off the bone and discard the skin and then the meat is stirred back into the pot. If you want to save time, you can use skinless and boneless chicken but we prefer the flavor and structure that comes from using bone-in chicken. For the same reason, we use only chicken thighs in this sausage and chicken gumbo although you can use any part of the chicken that suits you. It takes a bit of time to make this Sausage and Chicken Gumbo and it’s worth every second. You may have noticed that we threw in about a pound of large shrimp that had been peeled. This is completely optional and if you follow our lead here, these go in about 10 minutes before serving. Classically, gumbo is made with okra which we omitted because of food preferences by my sous chef for the evening. That’s OK because from what I’ve read about gumbo recipes is that there really isn’t a recipe at all. Instead, it’s a pinch of something here, a little more spice there. Once again, the is a basic tenet of real cooking. 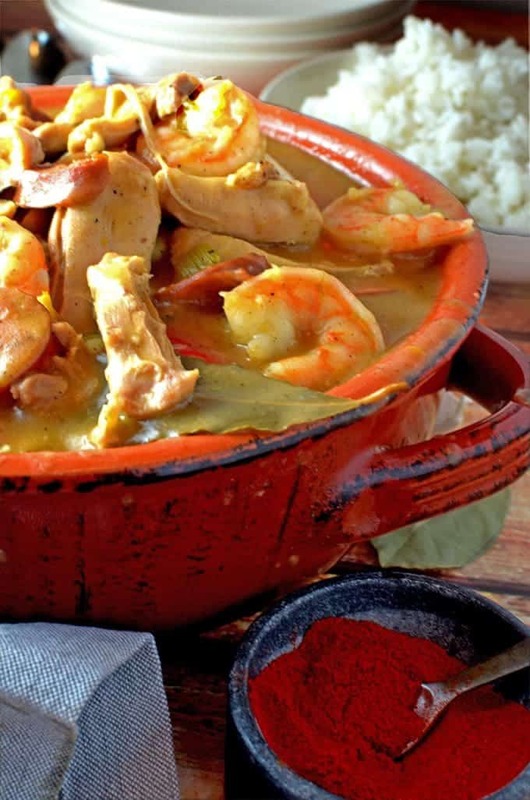 This authentic and lively Cajun stew if full of real food with real flavor. Adapted from Paul Prudhomme in The New York Times. Placer chicken pieces in a bowl. 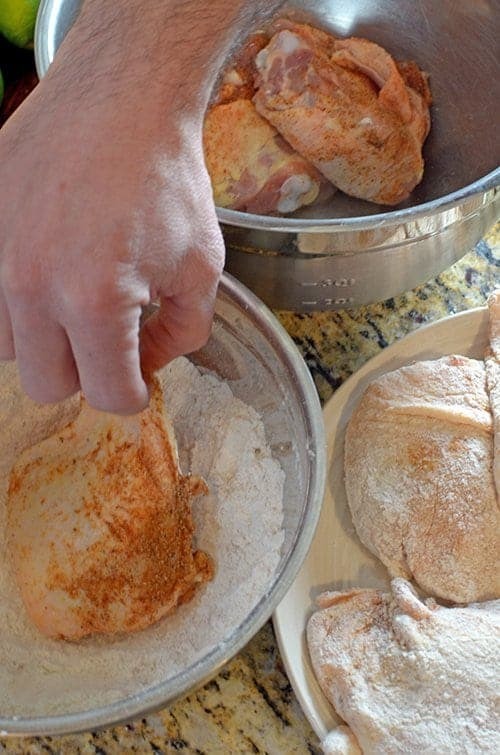 Mix salt, peppers, mustard, the cayenne pepper, paprika, garlic powder and file powder along with the Cajun spice. 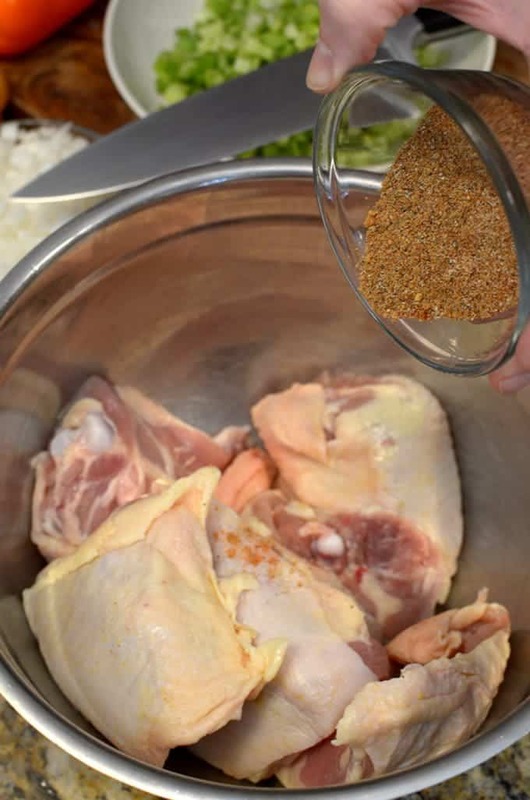 Rub about four teaspoons of this mixture all over the chicken. Reserve remaining spice mix. Place the flour in a large bowl and add remaining reserved spice mixture. Mix well. Next, heat a large and then add the oil. 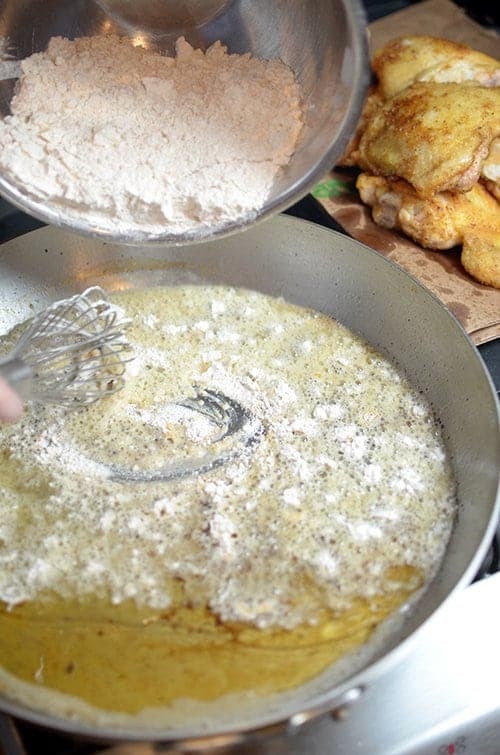 Dredge the chicken pieces in the flour mixture to coat well on all sides and then gently shake off excess flour. Reserve the remaining flour and set aside. When the oil gets hot and almost to the smoking point, place the chicken pieces into the skillet, skin side down. Cook about three minutes on each side until golden brown. Sear the chicken in batches and do not crowd the pan. Drain thoroughly on paper grocery bags or on paper towels. Heat remaining oil over high heat until almost the smoking point and then stir in reserved seasoned flour. Stir the roux rapidly and constantly, using a wire whisk until it thickens and turns a golden brown. Be careful not to burn the roux. While you are making the roux, bring the broth to a boil in a large saucepan, on a separate burner. Next, stir in the finely chopped onion, celery and green pepper to the roux. Cook the roux and vegetables for a couple of minutes and then remove from the heat. Add about half of the roux and vegetable mixture to the broth, be sure to stir rapidly with the whisk. Gradually add the remaining roux, being sure to stir vigorously, throughout the process. Add the andouille sausage and stir for a bit. Continue to cook, stirring frequently from the bottom of the pot. Do this for about 15 minutes. Finally, add the seared chicken pieces along with the bay leaf and the minced fresh garlic. Cook about an hour, on medium-low and be sure stir occasionally. Using a slotted spoon, remove the chicken from the pot and allow to cool slightly. Next, cut the meat from the bones, discarding skin and bones. Shred the chicken slightly and return to the stew, be sure stir it in well. If using shrimp, add them to the pot, stir well and continue to cook over low heat for about 10 minutes. Prepare rice (or potato salad) and serve, spooning the rice into the gumbo. 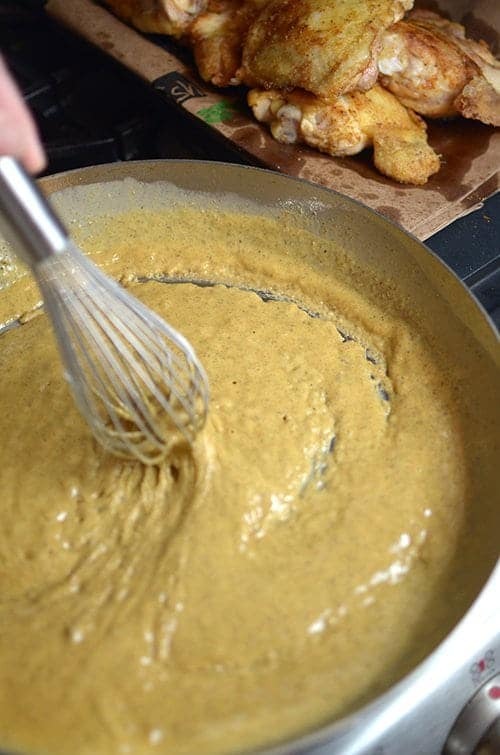 When making the roux, adjust the amount of flour necessary to created a proper consistency. It should have a pasty consistency when it is finished. Consider giving the sausage a quick sear in a separate skillet, prior to adding to the gumbo. This will give it a nice finished texture and add a little sweetness from the caramelization process. You can substitute kielbasa for the andouille sausage. Either way, using smoked sausage will enhance the gumbo's flavor. 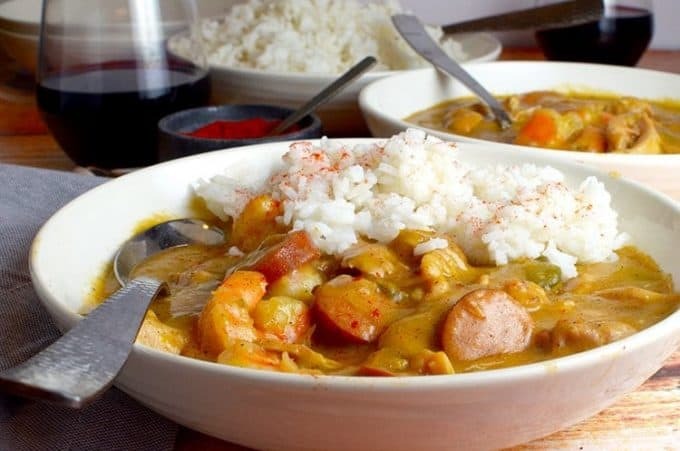 White medium or long grain rice is best suited for gumbo as the shape and size of the rice grains is optimal for being coated with the sauce and that means more flavor and taste with every bite. Finally, and most important, as with all recipes, make this gumbo your own. Adjust the seasoning (and other ingredients) to your taste. There is never a reason for bland or over or under flavoring, you are at the wheel so make the journey memorable and delicious! These look exquisite. I never made or eaten Gumbo but I always want to try, and your recipe inspired me to try it. Thanks so much, Carlos. 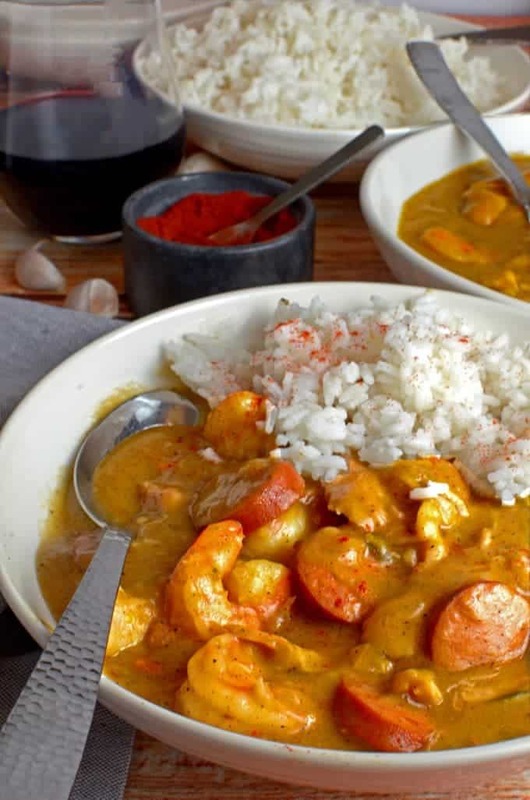 Living in south Florid where you are located, the fresh seafood begs to be used in a rich and flavorful gumbo such as this. I hope you give it a try sometime and as always, we love hearing from you! Thanks, Pamela. Our gang made short work of finishing this gumbo! Oh, that looks good. A perfect weekend or crowd pleasing dish. Love it! Thanks for sharing.